One New Aftermarket Replacement Hydraulic Pump (22 GPM) made to fit Ford Backhoe models: 340, 340A, 340B, 445, 445A, 450, 540A, 540B. This is for the Vickers gear style pump. It will fit on the machines with the Cessna pump with some line modifications. See our other listing for the Cessna replacement Pump that requires less modifications. 13 SPLINES Replaces Part Numbers: 85700189, E7NN600BA, E7NN600BB, D8NN600DA, E6NN600CA. Reliable Aftermarket Parts is in not affiliated in any way with OEM manufacturers. All OEM part numbers and logos are to be used for identification purposes only. We carry parts for Engines, Transmissions, Front & Rear Axles, Hitch & Drawbars, Undercarriages, Final Drives, Seats, Bearings, Cups, Cones, Seals, Discs, Couplers, Gears, Brakes, Pressure Plates, Pilot & Throw Out Bearings, Ring & Pinions, Gaskets, Decals and MORE for most high wear items. We also carry replacement parts for the Boom Cylinder (Seal Kits, Tubes, Glands, Pistons, Rods). 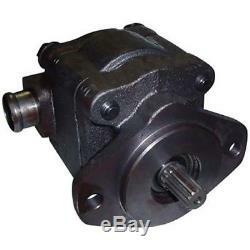 The item "85700189 Hydraulic Pump for Ford New Holland 555C Loader Others" is in sale since Wednesday, August 27, 2014. This item is in the category "Business & Industrial\Heavy Equipment, Parts & Attachments\Heavy Equipment Parts & Accessories\Construction Equipment Parts". The seller is "reliableaftermarketpartsinc" and is located in Williamston, Michigan. This item can be shipped worldwide.